Now don't we hear a lot about this subject these days. And it is a complex one. I'm not an expert on the environment by any means, nor am I ready to leave all my modern conveniences behind, but I am trying to do my part to be more aware & responsible. Recently some bad news has come out concerning plastics, especially when they are heated. And it does make sense to me if you take a bunch of chemicals and form a product, some of those chemicals could be harmful. But I know firsthand in a medical setting plastics are necessary. More research should be done for sure. Well I'm also trying to make more environmentally friendly decisions with my business. 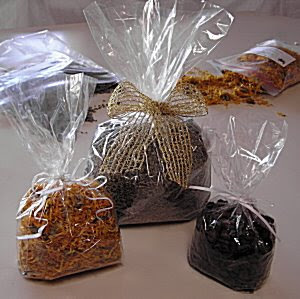 In addition to buying my ingredients from local sources and using some organic ingredients, I try to use biodegradable, natural materials for my packaging. I use paper plates for my cake, 100% cotton string, and cellophane bags. Here is more information on cellophane. I try to make responsible decisions and right now it seems like cellophane bags are safer for the earth & safer for my customers. My labels are not biodegradable, but I'd like to find some that are. I also print my brochures up on 100% recycled paper. I have spent some time & more trying to use more earth friendly goods. And I'll continue to research & be aware of products I use in my business. I didn't know that about cellophane. I'll try to remember it for future purchases. I'm definitely not an environmentalist, but I do strongly believe in conservation of natural resources. Where in the world is Elizabeth Root?